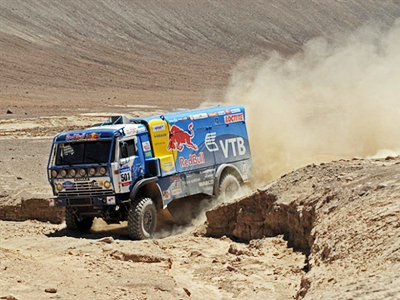 Russia's Kamaz driver Vladimir Chagin has won the first stage of the 2011 Dakar Rally's truck class in Argentina. Six-time Dakar champion Chagin completed the 222-km distance from Victoria to Cordoba in 2h 44m 22s, 4 minutes and 41 seconds ahead of Czech Ales Loprais (Tatra) and 5:52 ahead of his teammate Firdaus Kabirov. The victory was the 57th stage win for Chagin. The rally, originally called Paris-Dakar, is taking place in South America for the third consecutive year and runs until January 16.